After including an official from the Council on American-Islamic Relations' (CAIR) Canadian branch in an outreach program last April, the chief of the Durham Regional Police Service conveyed regret and pledged to be more careful. According to Sohail Raza, director of the anti-Islamist group Muslims Facing Tomorrow, the chief acknowledged more due diligence was necessary "so that inappropriate interests would not be inadvertently legitimized." That message has not reached Ottawa, where a city/community partnership called Crime Prevention Ottawa (CPO) appears intent on repeating Durham's error. A program set for this Friday, "Addressing Hate Crimes: Creating A Safe City for All," features the same CAIR official who prompted Durham's introspection. Amira Elghawaby is a spokeswoman for the National Council of Canadian Muslims, which changed its name from CAIR-Canada in 2013, openly admitting it was a cosmetic change: "We remain the same organization," a news release said. The Ottawa Police Service is among the CPO's member organizations. In the United States, FBI policy since 2008 has prohibited this kind of outreach with CAIR because of evidence its agents uncovered linking CAIR to a Muslim Brotherhood-created Hamas support network in the United States. "[U]ntil we can resolve whether there continues to be a connection between CAIR or its executives and HAMAS, the FBI does not view CAIR as an appropriate liaison partner," then-Assistant FBI Assistant Director Richard Powers wrote. That policy remains in effect. Its wisdom was reinforced by a federal judge in Dallas, who found that the "government has produced ample evidence to establish the associations of CAIR" to Hamas. CAIR has had only one leader since its 1994 creation, executive director Nihad Awad. In a 2003 affidavit, CAIR-Canada's chairman acknowledged that the U.S. CAIR "has direct control" over the Canadian branch. The NCCM denies any ongoing relationship with CAIR. Still, none of those documented connections – between CAIR and a Hamas support network, and between CAIR and the NCCM – has proven sufficient to get the Ottawa Police Service's attention. In 2005 testimony before a Senate committee, then-Chief Vince Bevin said CAIR conducted training sessions "about cultural issues" for his officers multiple times a year. It is unclear whether those sessions ever stopped. The problem with Friday's CPO program, and with the Ottawa police attitude in general, Raza told the Investigative Project on Terrorism in an email, is that participants will get a skewed perspective. Raza is a member of several Muslim organizations that do not share CAIR's Islamist ideology. Among them, Muslims Facing Tomorrow advocates for "the views of Muslims who believe Islam is open to reform and to new ideas in the advancement of human knowledge, and who oppose extremism in all forms in the name of Islam or any other faith-tradition." He also is part of the Muslim Reform Movement, which includes Canadians and Americans who fight for "a respectful, merciful and inclusive interpretation of Islam" and reject "interpretations of Islam that call for any violence, social injustice and politicized Islam." In contrast, CAIR and the NCCM do not address reform and Islamism in any direct fashion, so if the only Muslims consulted by government agencies are from such groups, Raza said, the message is limited. "We find their activities at best shady and mis-leading for the Muslim population of Canada," he said. As is the case in the United States, Jews are targeted more often by hate crimes – most recently, Ottawa saw three incidents in one week. But in Ottawa, a variety of religious institutions have been defaced by graffiti, including swastikas and racist slurs since the hate crimes program was announced. That includes the city's largest mosque, and a church whose pastor is among Friday's panelists. Thus far, the CPO and the Ottawa police have exhibited little interest in opening their outreach to hear more varied opinions, Raza said. Social media sites operated by the Ottawa Police's Diversity Unit exemplify this point. 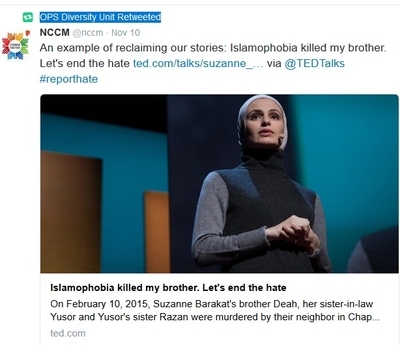 It re-posts Twitter comments by the NCCM and Elghawaby, including a Nov. 10 link to an article about the murder of three Muslims in North Carolina that is cast as an act of Islamophobia. Local police say they have found no evidence to substantiate that claim. 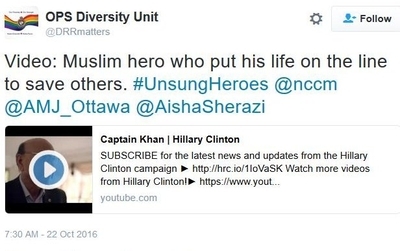 In October, the diversity unit promoted a partisan political ad for Hillary Clinton featuring Khizr Khan, whose son, U.S. Army Capt. Humayun Khan, died protecting his comrades from a 2004 car bombing in Iraq. It's one thing to promote the Khan family's story, and examples are easily found, but the Ottawa police chose to take sides in the election cycle of its neighboring country. The CPO has a three-person staff, one of whom touts his work with the NCCM in his biography. Given that, and the NCCM's desire to maintain a monopoly on the public discourse about Muslims in Canada, it is clear that dissenting voices like Raza's would have difficulty gaining traction. That, Raza argued, is not in the public's interest. He is not trying to silence anyone else. But in programs which value diversity, he believes diversity of opinion is lacking. "There is a serious problem of a global jihadist insurgency and we have to name radical Islam as the main culprit. They are not going to get this conversation going with NCCM types because they are on the defensive," he said. "If these institutions are going to reach out to the likes of NCCM (which obviously they are free to do) they should also have progressive and reform minded Muslims at the table so they get a balanced perspective."